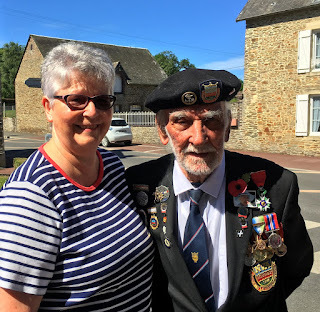 Normandy Life: Mosaic Monday # 44 - Commemorating 73rd Anniversary D Day Landings 1944. Mosaic Monday # 44 - Commemorating 73rd Anniversary D Day Landings 1944. 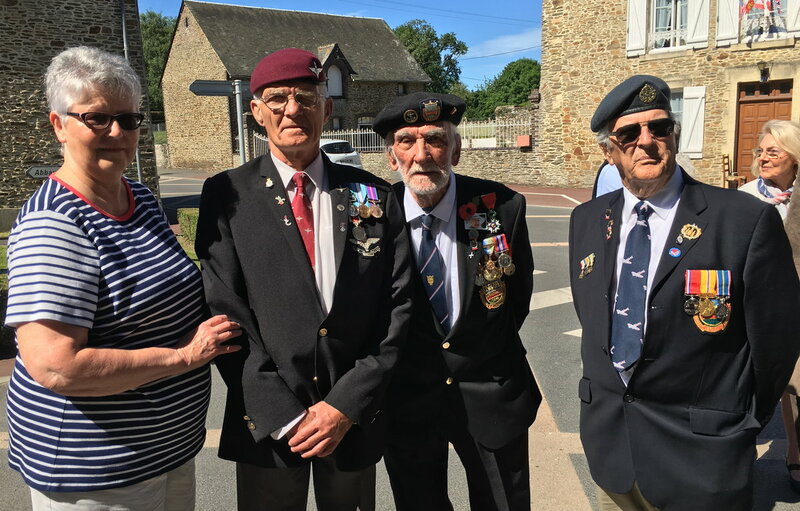 Since the end of May and going through until the end of July towns and villages throughout Normandy have been Commemorating the 73rd anniversary of the D Day landings. Here is a link to the program of events list on the D Day Overlord website, it is very extensive. The first event listed was an afternoon concert of the Choir of the French Army at the Cathedral of Bayeux. Some of the over 150 events taking place during June and July include historical walking tours; guided tours of the beaches; reenactments; parades of military vehicles; picnics; fireworks and bagpipers. 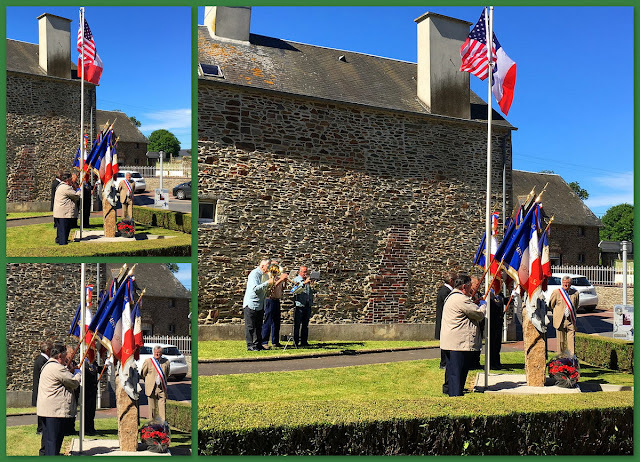 On Saturday morning the 10th of June as I was driving through Cerisy I saw a small ceremony taking place at the Memorial for the 2nd Infantry Division on the "Avenue de la 2ème Division Indian Head, Cerisy-la-Fôret. This memorial commemorates the American 2nd Infantry Division which liberated Cerisy-la-Fôret on 10 June 1944. The command post of the division was also in this village, from 15 to 29 June 1944". So I stopped to pay my respects. Also attending the ceremony was a British veteran of the D Day landings Mr Edwin Jeffery aged 94, his daughter who lives in the village, introduced us after the ceremony was over. She very kindly took photographs of us together and also with two other gentlemen, decorated British veterans of later conflicts. Click here to meet Edwin Jeffery a hero who was awarded the Legion d'Honneur in 2014 for the part he played in liberating France in 1944, serving as a 21 year old seaman on Royal Navy HMS Vanquisher on D Day,. Amazing post. I don't think we as Americans can ever fully understand and feel the emotions of the British during this awful time in history. Thank you for sharing. History right now. Thank you Maggie. Hugs. Always very moving and should always remain in our memory in keeping those things so precious close to our hearts. I hope that you received my email last week. Amzing and impressive post! many thanks for sharing these pictures showing the commemoration of the historical events. Have a sunny new week in June! And a great day, too! Thank you for sharing this Maggie, I'm always interested in all that happened in those WWII days! Nice pix of you with those great veterans - hopefully they know how much we have to thank them for. A very important anniversary that we do well to remember year after year, Maggie... Lest we forget! Wow, Maggie! Wonderful post. History that we should never forget. What a serendipitous event to come across .. and what an honor to meet that hero. We must never forget our history. Thank you for reminding us. And for hosting. Maggie, thank you for sharing this. Our trip which focused on the D Day planning, invasion, and surrender will forever be the most meaningful trip of my life. Our countries owe everything to these brave men and women. I remember how grateful the French and Belgium people were for the Americans and British who came to help. We had a British major along on that trip. Thanks for hosting Mosaic Monday. Maggie, Thanks so much for your post today. We need to remember these historic events. Sylvia D.
Great shots of an important event, Maggie. Another "imperceptible" blended mosaic from me today. I like how you said you stopped to pay respect. That doesn't happen so much anymore. We need to keep setting examples for the younger generations. I agree with Podso...how nice of you to stop to pay respect. Lovely photos of a special visit! Happy MM! Hugs! How wonderful that you stopped. That act of paying your respects looks truly worthwhile I am sure the Veterans were pleased to see you and have their photos taken. Lest we forget indeed. sounds like it would be a fascinating time to visit. Happy travels. It's good to remember and commemorate the sacrifice of so many. I know that we were very glad to have visited the beaches of Normandy last summer on our cruise down the Seine. Soon there will be no veterans left. Great photo of you and the veteran. Interesting post. D-Day was before my time but it was very significant to my parents. My dad served in the Navy during WWII. What a lovely surprise it must have been for you to have 'stumbled' upon this wonderful event, so important and meaningful to the citizens of France and the world, in general. Great pics, Maggie! Great photos Maggie. The II World War was a terrible thing. What a really wonderful post and activity. I'm so glad you were part of seeing the D-Day celebrations. Such an important holiday to remember, now more than ever. 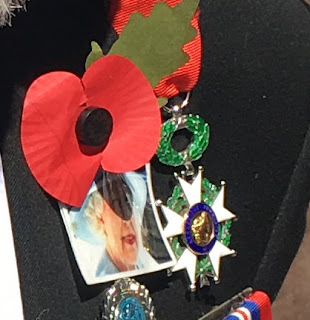 Dearest Maggie; Wonderful post and Great to see you with these veterans. It sure is an important holiday to remember history and pay respect. Lucky for us also that you had kind lady to take pictures♪ So sorry for my belated comment.